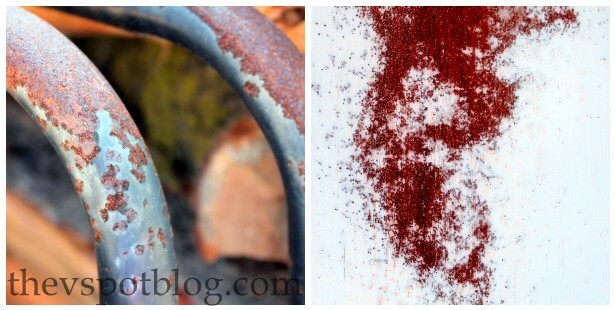 Create a faux-rust effect using spray paint and salt. Yep. 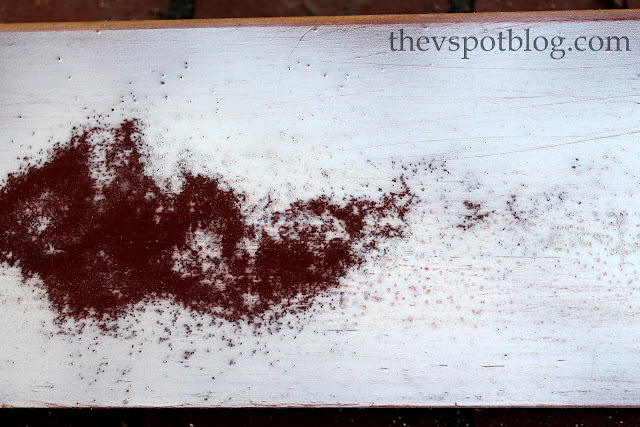 Spray paint and salt can give you an instant weathered iron effect. You can create a faux rust effect using these ingredients. A dark color in rust or charcoal, salt and your top color. I used regular salt for this, but you could use rock salt or epsom salt as well. Sprinkle the top with salt in the random places you want to create the chipped and weathered look. Carefully, carefully spray short bursts or your top coat. You have to use a light hand for this or you might blow the salt away with the force of the spray. Let the paint dry, then knock/brush off the salt with a rag or a dry paintbrush. You can leave it as is or you can lightly sand it. I plan to take a basic terra-cotta flower pot and make it look like a chippy iron pot. There you go. Easy peasy, shabby chic. Holy cow that is amazing!! Ooh what a great tip! I can’t wait to see your faux iron chippy terra cotta pot! This is something I definitely plan to try! How cool is this? Hope you feel better! how neat!! thanks for the trick! Wow! This is fantastic! I can’t wait to find a project to try it on! Thanks! Thanks for sharing! I hope I can find the needed stuff here in Europe! So cool! You should submit this to Power of Paint. Easy peasy for SOME people but not everyone. What’s the matter? I hope you feel better soon! At least you’re still playing WWF! That is so cool Vivienne, I love it! And I am so sorry you’re sick – boo! I hope you feel better soon! Getting excited for your visit in a couple of months! Viv you are amazing! This is one of the coolest distressing techniques I’ve seen! I love the way it turned out. Love this new technique!!! Thanks for sharing! Very cool! Hope you are feeling better. This is so smart. Thanks for sharing! Oh Vivienne! I should have known this was you getting all scientific and crazy with the salt and paint!I would love for you to come link it up at my party going on right now! ps catching you next week. I love it, what a great tip! 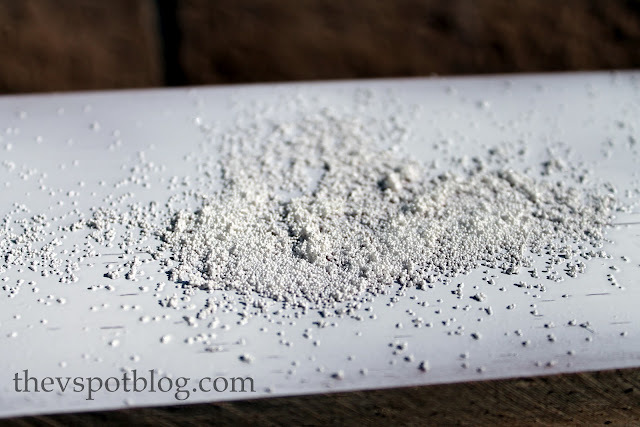 I recently posted the recipe my Hubby uses for diy chalk paint, this is something I’ll share with him. Thanks so much! I love it! Today I was spray painting outside and water dripped on my board while I was painting. I thought, “hey that looks pretty cool; I might have to do this on purpose sometime!” But salt?? I never woulda thunk! Okay, gotta try this. I love the look. Thanks so much for sharing. Im new to blogland, only 3 weeks in so COME FOLLOW ME. I’ve just become your newest follower. Gee… that’s exactly the tip I’ve been looking for… I’m from Brazil, and here these terracota vases are so expensive. I was just trying to find out how to make them look rusty. Great tip, wonderful blog!!! 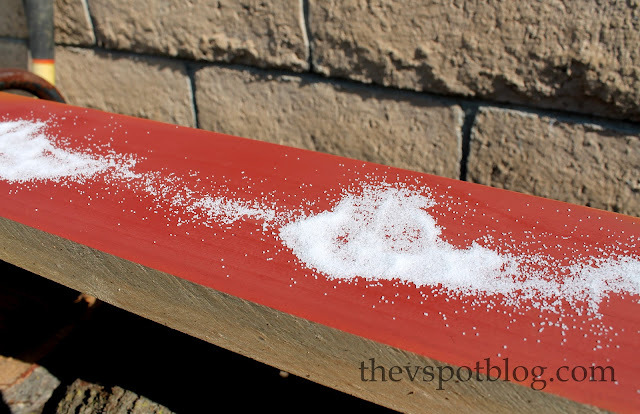 You can lightly mist your surface to help the salt stick. This is especially useful if you are not working with a flat surface. I am a model railway guy and use the teqnique all the time. Love the crossover of information! I know exactly what I’m going to try this on!!!! Hi there, Great tips by the way and thank you. raised-bed vegetable garden (lots of land, economical, deer)? If you had some insight I would greatly appreciate it. 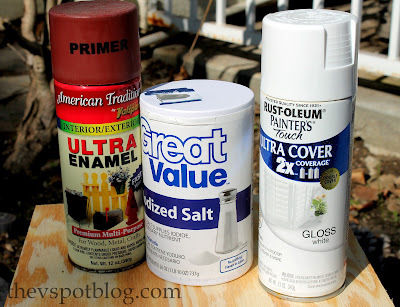 Do you have to use spray paint or can you use other tYpes of paint? It really does need to be spray paint. Faking the look of trendy pottery pieces. An easy DIY. DIY Patriotic Flag Artwork in about an hour. Make your own frosted, icy branches. Easy faux robin eggs for spring. A video tutorial. Make weathered, shabby chic flower pots using spray paint & candle wax. Coastal Craft: easy DIY starfish made from salt dough.